Oh, how tantalizing and frustrating these passages from Mark can be. If Mark is written in Rome in the late 60s (and tradition says that Peter is the eyewitness behind that earliest gospel), is it possible that word has reached Rome of the martyrdom of James by Herod Agrippa around the year 44 A.D.? Some scholars think Jesus actually foretold that death when he told the two sons of Zebedee that they would indeed share in the cup of his own suffering (Mark 10:39). That’s when Herod got it into his head to go after some of the church members. He murdered James, John’s brother. When he saw how much it raised his popularity numbers with the Jews he arrested Peter—all this during Passover week, mind you—and had him thrown into jail. He was planning a public lynching after Passover (Acts 12:1-4). If only we were given just a little more. 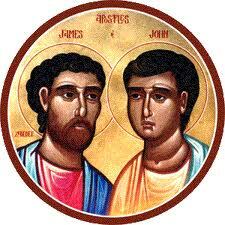 James is the only apostle whose martyrdom is related in scripture. Tradition tells us of the crucifixion of Peter, and the accounts of the deaths of the other apostles, though not biblical, are precious to the memory of the Church. But I think that the MOST interesting search is for the martyrdom of John. Jesus says that both the brothers will drink from that CUP, but what happened to John? He disappears after the Council of Jerusalem in 50 A.D. (Galatians 2:6-10). Or does he? Google “John, the son of Zebedee” and jump into one of scriptures most intriguing mysteries. Then join the conversation here to chat with Catholics around the country about this fascinating topic. Have you ever felt closer to Jesus during a time of your own suffering? Kathy, you raise interesting questions about what happens to John, and I’m firmly in the camp of his living a very long time. The writings of Papias and the lineage that can be drawn from Irenaeus, who was a disciple of Polycarp, who was a disciple of John, seem to go together to indicate that John must have lived until a very old age. I believe the “beloved disciple” who authored the Gospel of John WAS the apostle John, and if we consider that the synoptic Gospels were composed first (and much earlier than John), it makes sense that he wouldn’t rehash what is contained therein, but rather, fill in with his marvelous theology and expand the readers’ knowledge of the Lord. I love the conclusion of John’s Gospel in which, it appears to me, he is laying to rest rumors that Jesus said he would not die. I can imagine the quite-elderly John, tired of hearing people assert that this belief as fact, concluding his Gospel by passing along what Jesus said to Peter: “If (IF, mind you) it is my will that he (John) remain until I come, what is that to you? Follow me!” Good advice to us all, I’d say. Did John die a martyr? Of course, we have no knowledge of that, but might the CUP from which Jesus tells him he must drink be one of another type of suffering? He was banished to Patmos and struck with visions (recounted in Revelation), some of which are horrifying. This gospel gives mr HOPE.hearing these Saints and companions of Jesus sucumb to such pride helps me accept and understand that Jeaua loves me in my many imperfections.